Lyseira grew up in a little village beneath a mountain’s shadow. Now, as she comes of age, her friend Helix is accused of murder and sentenced to death. Forced to choose between watching him die and the staggering risk of rescuing him, she launches her friends on an unforgettable journey – one that will change them all forever, and set the world itself down the path of history. 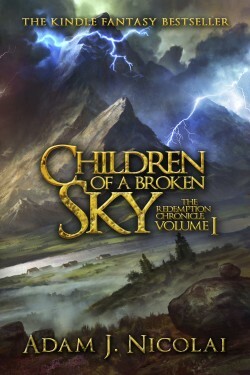 Kindle readers have pushed Children of a Broken Sky to the Kindle Fantasy Bestseller list again and again. Join them in a land beneath a broken sky, where sorceries clash with miracles, mountains are crowned with lightning, and conviction can topple empires. If you love fantasy in the vein of Sanderson, Jordan, and Brooks, this is the book you’ve been waiting for: the start of a 6-novel epic that will leave you breathless.